The 10th Anniversary E-Magazine of Devmudraa is out now ! Fifth edition of 'Nrithya Bharathi' festival conducted by Natyasaraswathi, Bangalore in collaboration with Devmudraa, Aurangabad. This dance theatre production focuses on issues related to Women, Farmers and Mother Earth. Represented our University and Aurangabad City in the United Kingdom. 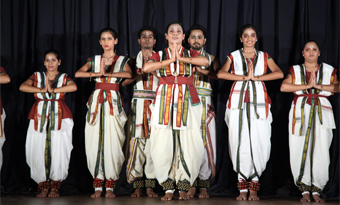 First time in the country that a dance drama on Sant Tukaram is directed and choreographed in Bharata Natyam. Devmudraa – a movement school, is a not-for-profit trust has been actively involved since 2006 in the promotion, preservation and dissemination of our heritage and culture through seminars, workshops and cultural festivals in Aurangabad. Our aim has been to generate interest in dance for all, young and old alike, experiment with new dance-theatre language by having an ongoing dialogue with traditional dances echoing social issues, in particular Indian dances. To bring you closer to understanding our language, we conduct classes, workshops and residencies to stimulate, challenge and change the mind and body for newer creative avenues. Dance is a expression of powerful energy. It is a continuous quest to conceptualize and translate life and its oddities in the contemporary life through performance. For quite some time, we at Devmudraa have been concerned about the arts being regarded as "elitist", accessible to a privileged few. We believe there is a correlation between shrinking audiences for the arts and an increase in the "disconnect" between artist and community. We see ourselves not just as an arts organization but also as a community outreach and arts development institute. 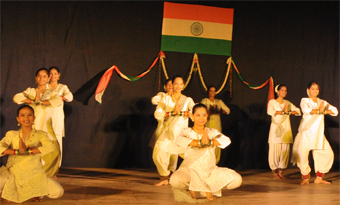 We want to take classical and folk dances, dance - theatre plays, awareness programmes and workshops for women and children alike, everywhere especially to schools and colleges, women organizations, reach out to people from every strata of society. Throughout the year Devmudraa Trust runs various workshops for interested patrons. The workshops help in appreciating our culture and dance as a vocation.